Day hikes do not require you to pack a mountain of equipment in loaded 40 plus pound pack, but that does not mean any backpack is up to the task. Day hikes can be as arduous, if not more strenuous than a multi-day hike so your pack choice matters. The best daypack for hiking will be one that fits well, is comfortable, is not too big (nor small), and that has the features and carries the equipment you need to face all the obstacles and challenges of the hike you chose for the day. Sizing a backpack is a bit different than measuring for size of a jacket or t-shirt. Just because you wear a small t-shirt or jacket does not mean a small backpack will be a good fit, so it is important to measure yourself to get a proper fit. With backpacks, torso length and hip measurements are key. Your Torso measurement is the vertical distance between your Iliac Crest and your C7 Vertebrae. First, find your hip bone. Second, find the outside seam in your pants that sits on top of your hip bone. If your hands were at your side, your forearm would rest against this area, it should be about the same level as your navel. This is your iliac crest. Note: do not use your navel height to measure because the torso measurement is meant to ensure the hip belt is in the correct location, so finding the top of the hip bone is critical. This is easier to find, feel your spine at the back of your neck. The large vertebra at the base of the neck is your C7 vertebra. Once you find your iliac crest draw an imaginary horizontal line that connects the two crests, like a belt over your two iliac crests. Measure the distance between the Iliac crest line and the C7 vertebrae and commit this number to memory, just like you would your pant size. This number is your torso length. Find the number in inches and centimeters as manufacturers may use either. Another reason not to use your clothing size to size a backpack is a difference between men and women. Women have relatively wider hips than men. Even a heavy set man can have narrow hips. Measure your hips at the center of the hip bone, below your navel and iliac crest, at the widest point. Use the hip measurement to compare with the backpack manufacturers size chart to ensure a good fit. Many backpack manufacturers offer interchangeable hip belts, so you can swap out a hip belt for one that fits better. With these two measurements you can find the best daypack for hiking that fits right and enhances your hiking experience. Hip Belt – the hip belt should sit at the center of the hip, at the widest part. Once adjusted to fit snug, the remaining strap should not dangle excessively as this indicates that the hip of the pack is too big. Shoulder Straps – should be comfortable and snug, but should not carry the weight of the load. Added features and organization will add weight to the pack. Consider your activity and whether you need the features that increase the weight of the pack. More strenuous and longer hikes, or hikes where you must pack in all water will necessitate heavier packs with greater capacity. Speed hikes and city hikes will not. Most daypacks have some type of ventilation feature. The most extreme ventilation systems separate the back from your back, leaving a gap for air. This will change the balance of the pack and the way it rides. If speed and agility are priorities, a pack that sits against the back is best. If you are carrying weight, load lifters should work to take weight off the shoulder and place it on the back. These straps sit at a 45 degree angle and adjust from the collar bone. Sternum straps help keep shoulder straps in a comfortable position. Many packs come with a sternum strap that adjusts for a snug fit. A few packs even adjust up and down to locate the strap perfectly. A daypack, as the name implies, is meant to carry one days worth of provisions. This can be vastly different considering the activity, but daypacks generally have between 20 to 30 liter capacity. For city hikes, speed hiking or running, smaller packs are king. For strenuous hikes, packs with internal frames may be needed, and they are heavier. Consider your activity before choosing capacity. Most daypacks open from the top, or from a front panel. The pack that opens from the top usually has a simpler design as everything goes it the top into one large compartment. Bags that open from a panel in the front usually have larger openings and often have more organization features. These features can contribute to weight, but they make accessing items easier. Some bags we reviewed are weather resistant, or include rain covers. While no backpack is waterproof due to sewn seams not being waterproof, some resist the elements better than others. Consider the weather you most often encounter and plan to face while using the pack. If rain is a concern, opt for a bag with a rain cover, or one that is compatible with a rain cover sold separately. This pack has good ventilation. The pack has ‘airspeed’ suspension which is a light alloy metal frame that gives the pack some structure. There is mesh stretched across the back for good breathability and comfortable load carry, and keeps the pack from having direct contact with your back. Shoulder straps are padded and contoured, as are the hip belts. Includes sternum and load carrying straps. Main compartment opens from the zippered front panel with a large opening at the top. The bottom compartment is used for sleeping bags, camping hammocks etc. There is a mesh pocket with key clip on top, a front zippered pocket. Two mesh stretch pockets on the side and two large zip pockets on the hip belts. Pack is compatible with hydration system and has hydration sleeve and ports. Several concealed bungee loops and removable sleeping pad straps keep the lines of the pack streamlined. Small pocket at the bottom contains a rain cover that can be easily removed and installed when needed. Plenty of storage, included rain cover, great ventilation and suspension. Back panel is not adjustable. 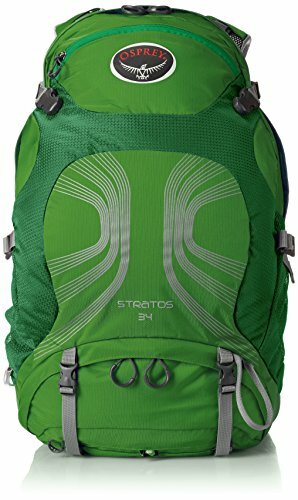 High Capacity pack for a long day hike or ultra light overnight hike. This streamlined Deuter lite 20 pack is one you will get a lot of use from. It is 530 grams, 1.17 lbs, made with sturdy rip stop and is weather resistant. The pack has a thin wire Delrin U frame for structure. The frame is removable and folds up when not needed. Includes a small waistband, sternum strap that can be vertically and horizontally adjusted. Has a clip for a water bladder. High quality YKK zippers, large easy grip toggles on the zipper so the pockets can be opened with gloved hands. Two deep mesh pockets that are hidden by a front panel, items will not fall out and pick pockets will not be able to easily get at your items. Large zippered top pocket, inner pockets and divider really keeps things organized. The back is teardrop shaped and conforms well to your body. When secured properly this pack is easy to move with. Lightweight small pack with a lot of pockets and storage, well designed and thought out backpack. The back ventilation could be better. This little wonder is one of the most compact best hiking daypacks and would be great for cold weather, city hiking or running. This pack was made for speed, maneuverability and security. The best day hike backpack in a compact size. This daypack has a small internal frame for structure. The pack has contoured padded shoulder and hip belts. The body of the pack also contours to conform to the curve of your back to make carrying a load more comfortable. The pack has loops and bungees to secure items to the pack. The front of the pack has a large stretch mesh pocket, big enough for a light jacket. Small zipper pocket at the top. Sides have smaller stretch mesh pockets. There are zippered mesh pockets on the hip belts. The pack is compatible with a hydration system and the hydration bladder can sit outside the back, under the mesh between the mesh and the main pack compartment. The pack has a sternum strap with included whistle. Pack has compression straps on the inside of the mesh pockets so you can compress the pack but still use the outside pockets. This is a small pack with a lot of structure and handy hydration compatible system and compression features. Overfilling the top pocket makes it hard to insert the water bladder. Best hiking daypack for carrying heavier items or making a more strenuous hike, due to included internal frame not often seen on daypacks. The best day hike backpack for strenuous hikes. 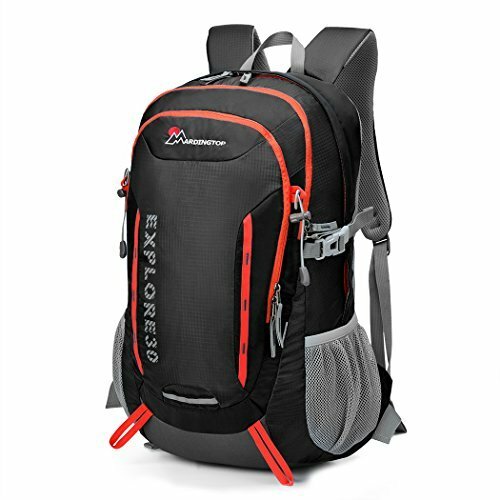 The Mardingtop 30 liter pack is a decent capacity daypack with a budget price and some nice features. Two side mesh pockets, adjustable sternum strap, whistle included, reinforced stitching for pack durability, S shape padded straps and a roomy organized front pocket make this a good daypack. The pack is weather resistant and comes with a rain cover stowed away in a small zippered pocket. Weather resistant, a lot of nice features at an accessible price. Can be used as a carry-on backpack, size is not too big or too small. The straps are on the narrow side and the bag is long. Great for someone who is tall. Durable, weather resistant, rain cover included – best budget pack for day hikes. 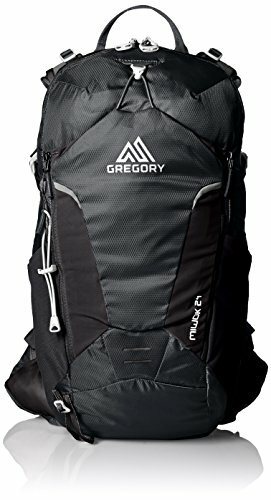 The Gregory Miwock Daypack is great for hiking, bike riding and day to day use. It is water resistant, but not water proof. The suspension consists of a spring steel wire frame with mesh panel that gives the pack structure and ventilation. The pack has 8 outside pockets including a sunglass stash on the shoulder. It has a separate pocket for a water hydration system and clip on the strap to hold a hose. The pack weighs 1.7 lbs and is made of lightweight material. The shoulder straps are padded and contoured for comfort. The hip straps are wide with a small amount of padding and have small zippered pockets. Panel load pack with one main compartment. And a mesh divider inside. The pack has compression straps. Has a tool loop and bungee latching points for storing items on the outside. Several pockets and storage, plus hydration system compatible. One size only, long in the torso. A great light pack with a lot of features and organization. Streamlined smooth look with everything you need without added weight. The best daypack for hiking with a streamlined look we found. 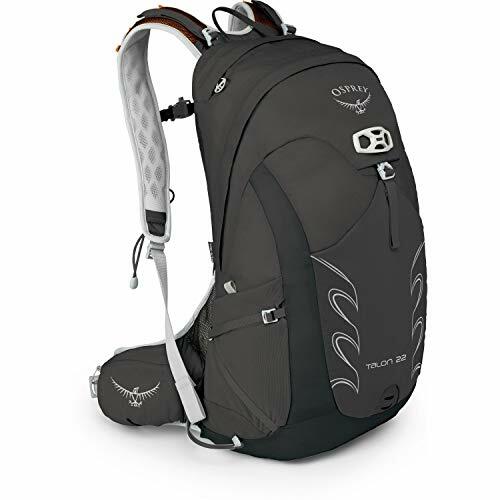 One of Osprey’s smaller packs, great for day hikes, cycling, city tours and the like. This pack has a separate hydration bladder panel to keep the bladder outside the bag. The lid lock can attach a Helmut to the bag with included bungee cord. Huge elastic mesh front pocket that can be secured with a bungee cord tighter and clipped closed. Several cords and hooks to attach tools. Two side mesh pockets for water bottles and such. Large main compartment that opens with a zippered panel. Zippered stretch mesh bags on the hip belt. Sturdy YKK zippers. Good amount of external organization. No internal organization in the main compartment except a zippered mesh bag on the underside of the lid, which needs to be open to access. 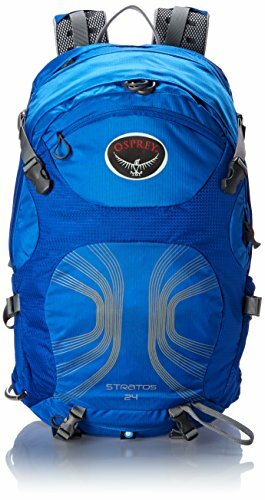 This is one of Ospreys smaller packs and is great for a day hike, cycling, city tours and other less demanding day trips. Hydration system compatible and good for shorter trips and urban trekking.